Cheapest Robot Coupe Robot Cook - Buy for under 2k! 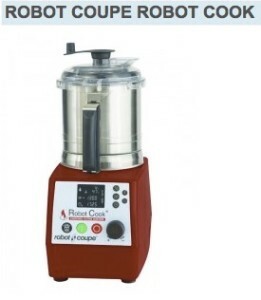 You can emulsify, grind, blend, chop, mix and knead to perfection with the new Robot Cook®, the only professional cooking cutter blender on the market. It is the ideal appliance, whether the recipes you are making are hot or cold, sweet or savoury. Chefs will love its combination of high speed and enviable cutting quality, plus its ability to heat ingredients to a temperature of 140°C, especially since it is accurate to within one degree. Its generously sized 3.7-litre stainless-steel bowl is perfect for the need of professionals. Bowl and lid scrapers, unique on the market. All parts are dishwasher safe. Cheapest Robot Coupe Robot Cook on the internet – how do I find out more? For more technical information about the Robot Cook, click HERE. At just £1,920.00 we believe it’s the Cheapest Robot Coupe Robot Cook on the internet – and we welcome you to have a look for yourself. If you can do better and find the Cheapest Robot Coupe Robot Cook on the internet elsewhere, contact us and we’ll do our best to match or beat your price – that’s a promise! ← Robot Coupe Machines now accepts PayPal!